The check-in was big last year though people are now questioning its basic usefulness as many look to what’s next beyond the simple act. But the check-in still has a lot of value, something social travel site Gogobot is illustrating with its new Foursquare and Facebook check-in integration. Gogobot is tapping APIs from Facebook and Foursquare to use check-in data for users, helping them fill out their travel history and using the information to share with friends and travelers. It’s an interesting use of check-in data, helping people create a digital journal or scrapbook of their travels that can be easily organized and shared in a structured way with other travelers and friends who can leverage a person’s experience. It’s all part of Gogobot’s larger promise of helping make travel planning and discovery more social. The company, which launched its site in November, already leverages Facebook and Twitter by allowing people to query their social networks to find answers about travel tips. Gogobot ingests the answers, recommendations and reviews from friends, and organizes it into structured data that people can use to help plan their trips. The site aggregates reviews for a location into passports that you can browse and share. Now with check-in data, it will quickly fill out a user’s passport for different places, allowing them to create special “collections” of favorite restaurants, hotels and travel spots that can be shared with friends. 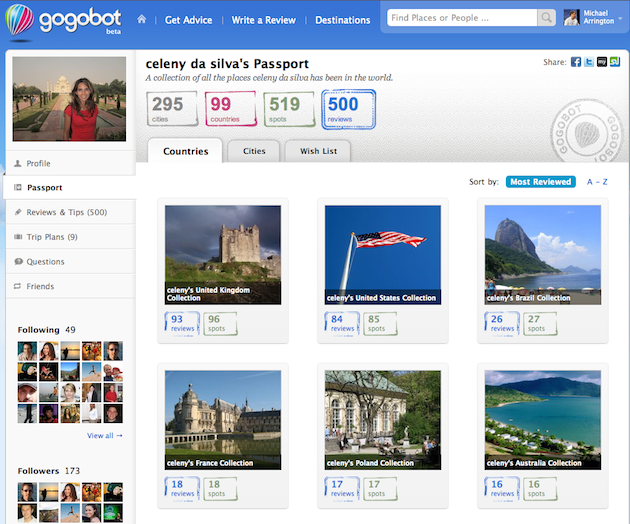 Gogobot uses an algorithm and some manual editing to help reconcile and organize check-in data. The company has curated its own location database that is a hybrid of sources and also includes about 110,000 travel images. The algorithm is designed to help filter out less valuable information for travelers such as check-in data for a work place, office cafeteria or home. Katz said Gogobot will be introducing its own mobile apps soon, but it’s happy to rely on Facebook and Foursquare for check-ins because they cover most of the check-in activity going on. I like what Gogobot is doing; leveraging check-in data and turning it into more of a lasting resource. Gowalla also tries to do some of that with its own passports. But with many location-based services, check-in data isn’t as organized or designed to be used as a broad travel tool. By ingesting and organizing check-ins, Gogobot can make them meaningful and useful in new ways, specifically for travelers. Check-ins don’t have to be all about offering deals or powering local recommendation engines. They can used for more prosaic things like family safety, as I wrote about with Life360, or they can help create important enduring databases. The company, which hasn’t released user numbers, raised $4 million in June from Battery Ventures. Founded by Katz, formerly Managing Director (International) at MySpace and Ori Zaltzman, former Chief Architect of Yahoo’s BOSS search, Gogobot is also backed by Eric Schmidt’s Innovation Endeavors.